Here is a handy round-up of the best of the current organic, natural, green, gluten-free and other deals thanks to Mashup Mom. $.75/1 Earthbound Farm organic frozen fruit and veggies (or other EB Farm product). Mambo Sprouts has added: $1.00/2 Dr. Oetker, $1.00/1 Crunchmaster Crisps, BOGO Kit's organic fruit & nut bar, and more. $2.00/1 Amy's Kitchen pizza (Facebook). The Wounded Warrior Project has: $1.00/1 gud by Burt's Bees, $1.00/1 Gerber organics second food pouches or two-pack purees, $.75/1 Silk fruit & protein. $1.00/1 Dream non-dairy beverage is back up on their site. $1.00/2 Immaculate Baking refrigerated doughs. $1.50/1 Burt's Bees body lotion. Amazon — as always, Amazon pricing can change quickly. With subscribe & save, you’re subscribing to repeat orders on a regular basis, but can cancel at any point under your account with no penalty. With coupons, you need to be logged into Amazon to view and clip, and they are one per account. 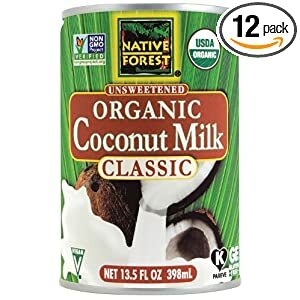 Native Forest Organic Classic Coconut Milk, 13.5-Ounce Cans (Pack of 12), $25.08 with free super saver shipping. Bob's Red Mill Organic Oats Rolled Thick, 16-Ounce (Pack of 4), $7.69 shipped with subscribe & save. Newman's Own Organics Newman-O's, Ginger-O's, 8-Ounce Packages (Pack of 6), $11.48 shipped with subscribe & save. The Gluten-Free Saver deal at the moment is 41% off Certified Gluten-Free Oatmeal, Oat Flour And Granola Bites From Gluten-Free Prairie. Check out bonus deals on the right for an offer on gluten free vegan macaroons from Hail Merry -- 10 bags for $29.00 shipped, which is just $2.90 a bag! 12-pack of O.N.E. Coconut water, $18.00 with free shipping. 800 Green N' Pack dog waste bags for $29.00 shipped. $20 shipped for a GrabGreen eco-friendly laundry package.